New accumulation is underway at Quelccaya. 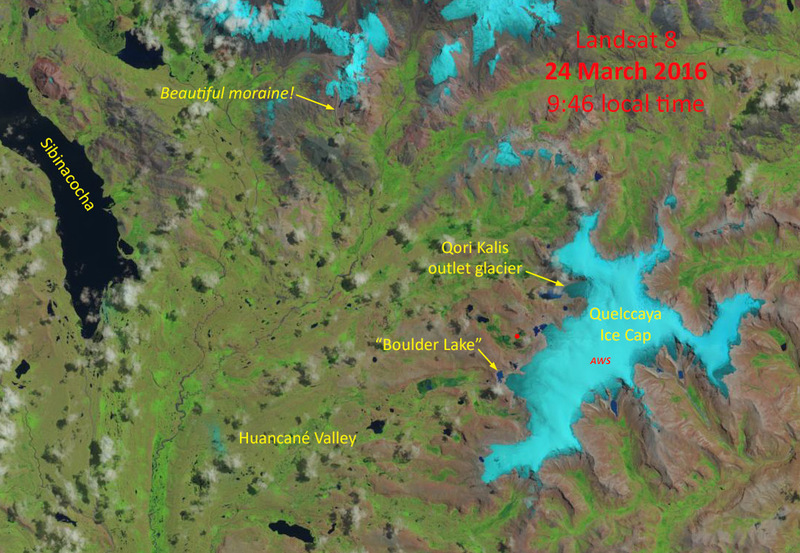 The image above depicts the ice cap and surrounding terrain on 3 November, thanks to NASA & USGS! 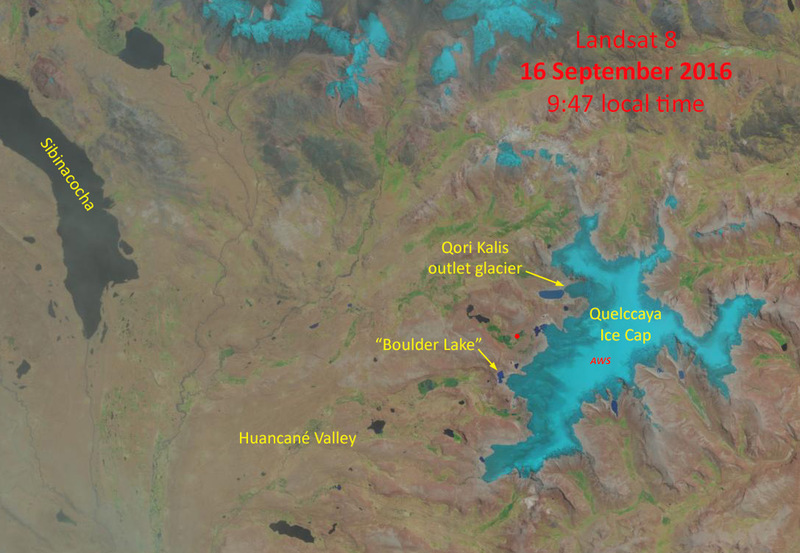 Contrast snowcover on the ice cap last week with that shown below on 16 September. 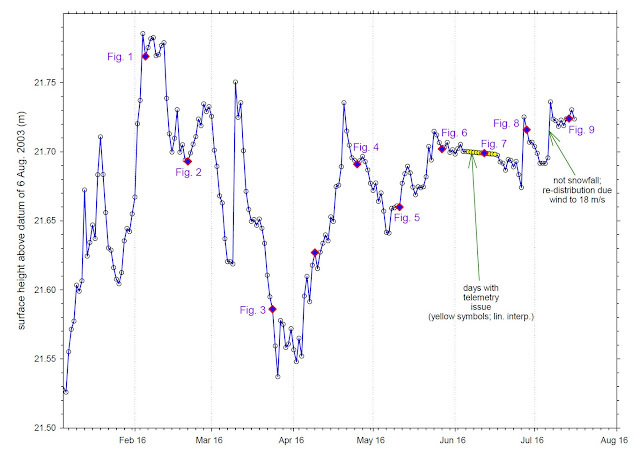 Telemetry of snowfall measurements from the Quelccaya AWS shows that about 6 cm of additional ablation occurred in the week following when the image below was acquired. Between then and 3 November (see above), the AWS recorded 32 cm of snow accumulation - which very likely indicates that the next wet season is underway. So, although net accumulation for the 2015-16 El Niño will be much below average, it appears that the event will indeed be recorded at the summit. This may not have been the case if the wet season began later, as is more typically the case. 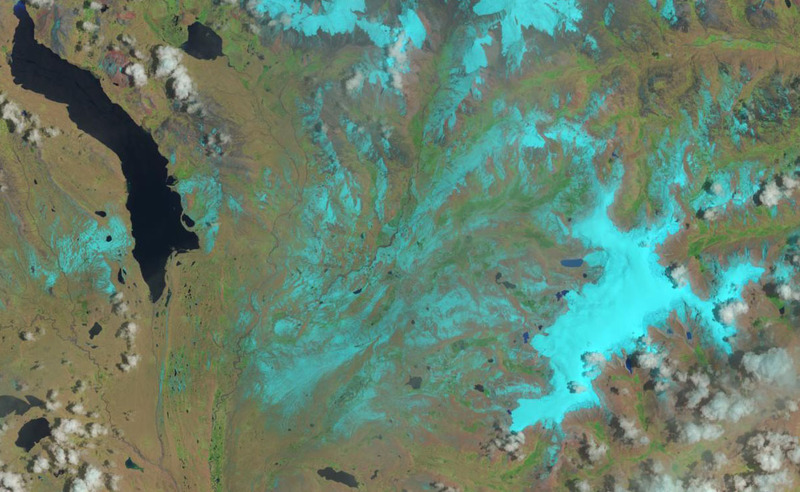 The transient snowline at Quelccaya reached ~5600 m in mid-September, as illustrated on the Landsat 8 image above. Had the wet season begun by then, only the upper ~100 m of the ice cap would have seen net accumulation for the El Niño year 2016. However, it is likely that ablation continued after the time of this image. 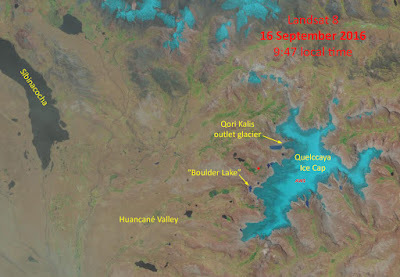 A subsequent Landsat image was acquired on 2 October. New snowcover is visible south of Quelccaya, but cloud cover obscures the ice cap. So, we must wait for the next few satellite passes to see whether the snowline continues rising - or if the new wet season has begun. The first opportunity for this assessment will be in ~10 days. This situation demonstrates a difficulty of mapping minimum snowcover extent from satellites. Thin high clouds (as in this image) or scattered cumulus clouds still allow snowcover assessment, yet cloud cover thick enough to obscure the ground prevents mapping. As a result, the spatial extent of accumulation cannot be accurately determined by remote sensing some years. Seasonality of accumulation and ablation: not simple! Earlier posts here have discussed how snow accumulation at Quelccaya during the 2015-16 El Niño was considerably below normal. We verified AWS measurements during April and May fieldwork, measuring for example a mere 30 cm of snow at an elevation only 130 m below the ice cap's summit! On top, we made comprehensive measurements and obtained snow samples for frozen transport and analyses which are currently underway. However, preservation of this meager accumulation will depend upon the extent of both precipitation and ablation currently occurring -- during the 2016 dry season (i.e., approx. June - October). The following sequence of Landsat 8 images were obtained from the USGS, corresponding to dates shown in pink/purple on the following timeseries of snow surface height at the summit of Quelccaya. Height increases are primarily the result of snowfall, while decreases mostly reflect melting. In viewing the images below, it might be helpful to have this graph open in another tab or window; click here for a jpeg or here for a PDF. A composite GIF of the images is shown first. For more detail on each image, scroll down. Captions for each relate snowcover in the scene to AWS measurements in the days and months prior. We will continue tracking accumulation at the summit and relating surface height to Landsat imagery as the season continues. Further information about accumulation in past years, and interpretation of AWS measurements, is detailed in our comprehensive paper in the Journal of Geophysical Research (Hurley et al., 2015). 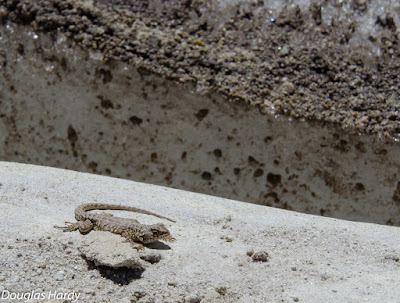 See our previous blog post for images of fieldwork during April and May. Fig. 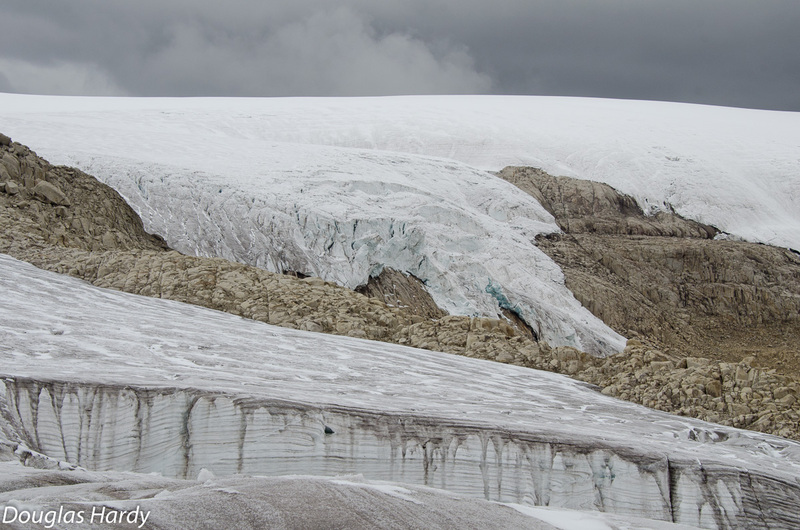 1 - Snow-covered glacier and snowy landscape (5 Feb.), after one of the final snowfall events of the 2015-16 "core" wet season. 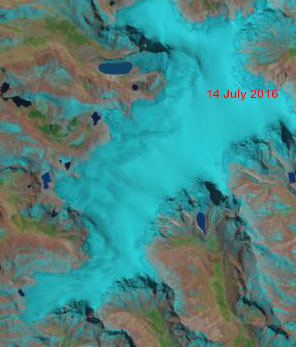 Although impossible to assess the depth of accumulation from this visual image, note high albedo of the entire glacier, raising the reflectivity of incoming shortwave radiation (solar). Fig. 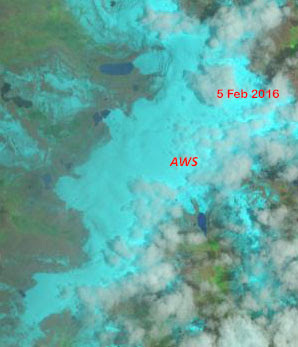 2 - Two weeks later (21 Feb.), glacier ice is becoming exposed around the margin, and snow has melted from the surrounding landscape. 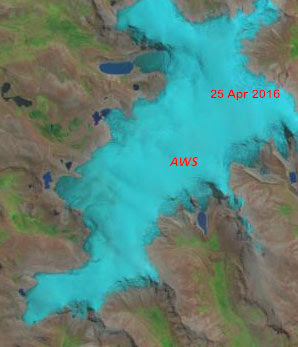 Most of the glacier remains bright (i.e., high albedo) due to a minor snowfall event several days prior (see graph above). The wet season continues through February, and as in figure 1, clouds are indicative of atmospheric instability. Fig. 3 - During the month between this image (24 Mar.) 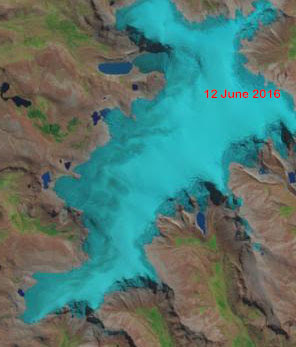 and that in figure 2, a net lowering of glacier surface height occurred, despite a snowy interval (late Feb.) and a large snowfall event in early March. 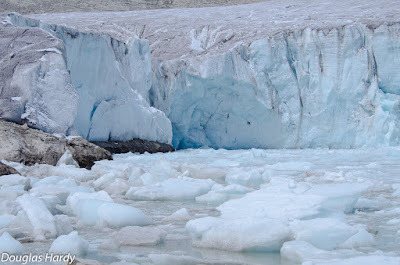 A larger area of glacier ice is visible around the margin, and albedo has decreased at all but the highest elevations. To the west of the ice cap a solid red circle indicates the location of our camp during April / May fieldwork. Fig. 4 - Only slight changes in the month since figure 3. On this date (25 Apr.) 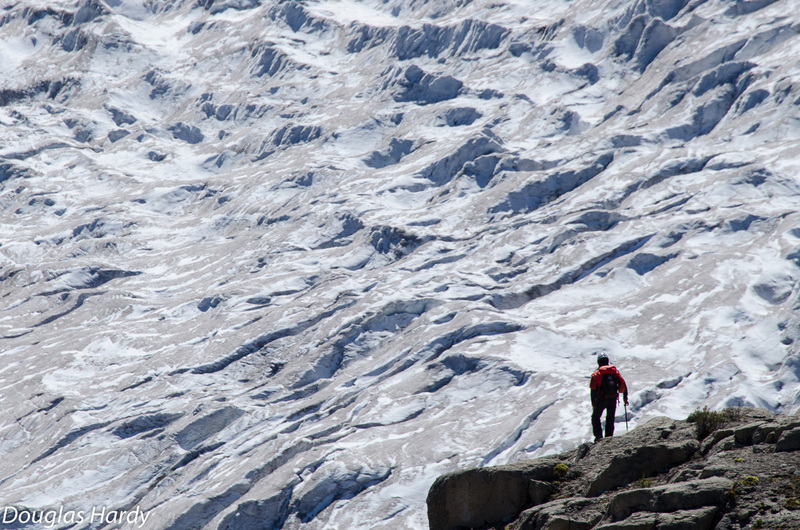 we were at the glacier, camped at the location indicated in figure 3. 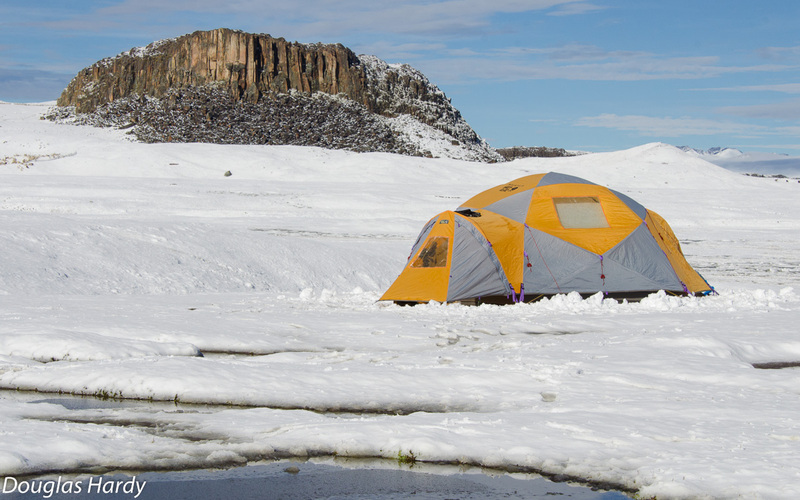 Just 5 days prior, a precipitation event with heavy graupel was sufficient to collapse one of our tents. Snowcover blanketed the regional landscape far to the west the next morning; four days later (see above), new snow remains on the glacier but has melted from the landscape. Note location of AWS, which is not indicated on subsequent figures. Fig. 5 - During our time at Quelccaya we observed a seasonal change in weather which we interpret to be the transition from wet to dry seasons. Between a few days prior to the time of figure 4 and our departure on 4 May, the atmosphere became considerably more stable. Particularly at lower elevations on the ice cap, the melt rate was tremendous, and with a thin cover of snow the transient snowline rapidly increased in elevation. 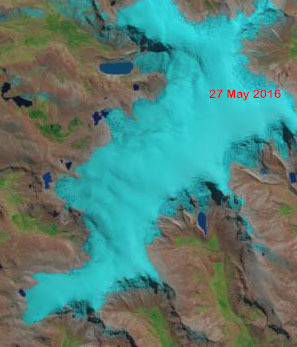 This image from 11 May - only 2 weeks after that in figure 4 - demonstrates how rapidly mass can be lost from a glacier in years of low accumulation. Fig. 6 - Rapid ablation earlier in the month was halted by a relatively minor amount of accumulation ending just a few days prior to this image (27 May). The receipt of net radiation decreased tremendously due to higher albedo of the fresh snowcover. Fig. 7 - Two weeks later (12 Jun.) mid-May snow accumulation is ablating. Due to a problem processing telemetry data, snowfall in the days just prior to and following this date is not known. Fig. 8 - This image of the same scene from 28 Jun. depicts a typical dry-season snowfall event which occurred the day before. This is the southern hemisphere winter, when air temperatures are lower and precipitation arrives in the form of snow at lower elevations than during the wet season. Although partially obscured by clouds, note widespread snowcover on the landscape. Fig. 9 - Two weeks after Fig. 8, snow lingers on the landscape, yet albedo is decreasing at lower elevations of the glacier as the new snow melts and sublimates. Ultimately, the extent to which 2015-16 accumulation is preserved will depend upon whether additional winter events occur. In general, however, surface lowering at the summit (i.e., ablation) typically - but not always - accelerates during August into September, and sometimes into October. Net accumulation for the mass-balance year cannot be determined until the subsequent wet season begins. We returned recently from an exciting 19 days of fieldwork at Quelccaya. The expedition was timed to coincide with the conclusion of the wet season following the very strong 2015-16 El Niño, and we gained considerable new information. 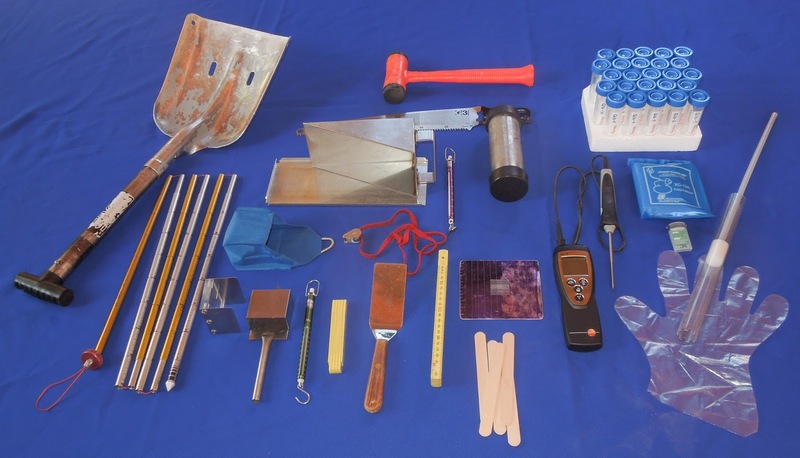 Specific objectives related to this anomalous year included: AWS data recovery and annual instrument maintenance; snowpit measurements and sampling for chemical analyses; and both GPS mass balance and ice margin measurements. 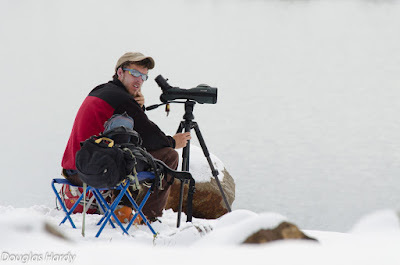 We also had an opportunity - which for over a decade was only a dream - to spend time learning about and documenting breeding behavior of the White-winged Diuca-Finch. 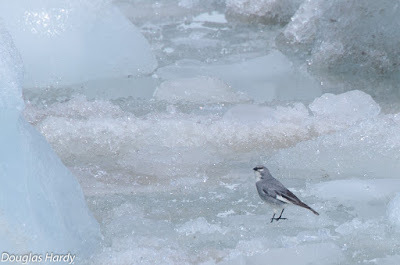 This species is among the highest-elevation nesting birds of the Western Hemisphere, and is the only species known to build nests on glaciers (see here for background, soon to be updated); our recent observations yielded a wealth of new understandings. As always, Vicencio Expeditions provided fantastic logistical support, allowing our team of 5 to work safely and efficiently. 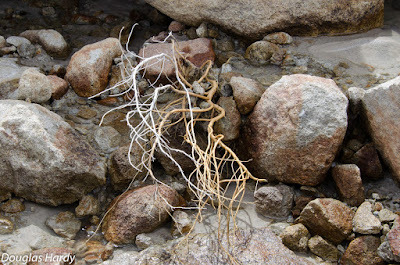 Below is a quick collection of images documenting some of our observations. Fig. 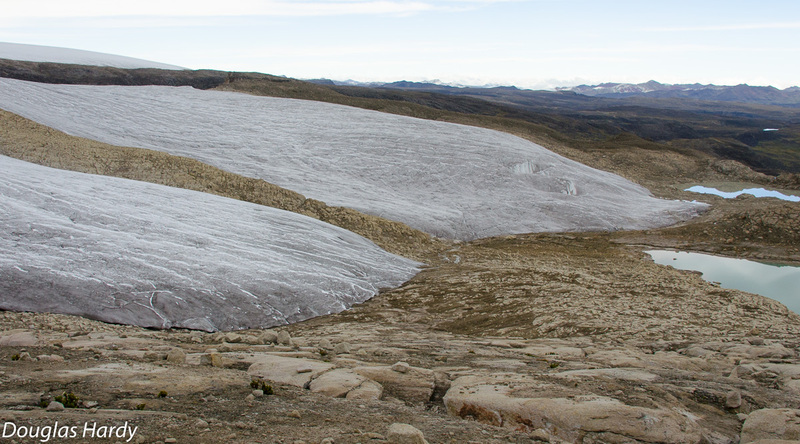 1 (above): Quelccaya Ice Cap's western margin, at which our group spent 2+ weeks during April and early May. Note that the transient snowline is already at nearly 5500 m, due to low accumulation and warmth during the strong 2015-16 El Niño. Qori Kalis outlet glacier is partially visible towards the left side of the image; our efforts on this trip were concentrated at the outlet glacier just right of center. Fig. 2: Alipampa Camp at the end of the road (4765 m), where we spent 2 nights acclimatizing. Snowfall overnight was somewhat unexpected. Fig. 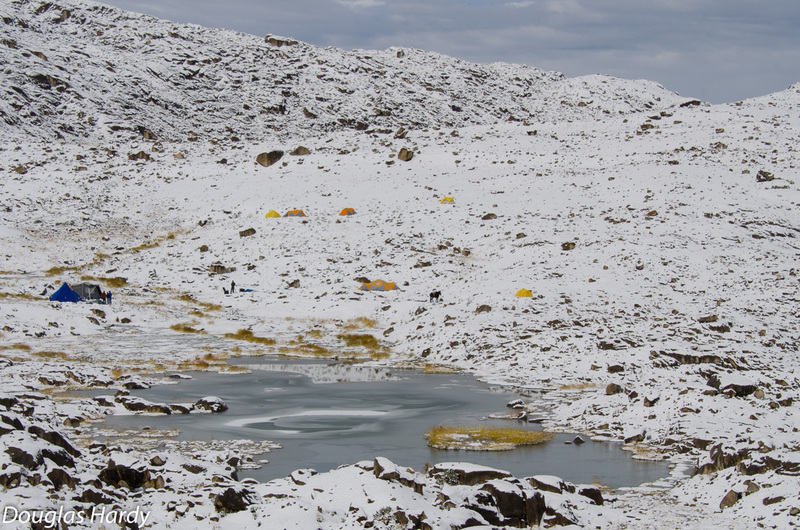 3: More snow, three mornings later, at Moraine Camp (~5200 m). Note frozen lake, as well as people and horse for scale. Fig. 4: Quelccaya margin just south of the figure 1 panorama. Tiny patches of new snow are visible on the otherwise-dark ablation zone of the lower ice tongue. This low-albedo surface absorbs roughly half of the solar radiation incident upon it on sunny days, becoming a maze of tiny meltwater runoff channels. Fig. 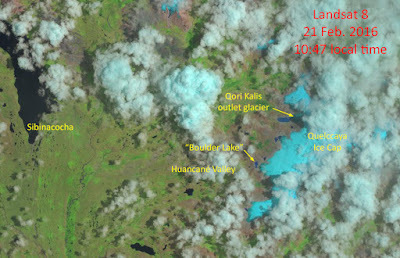 5: Qori Kalis outlet glacier, which has thinned dramatically in recent years - yet still extends into the lake. Fig. 6: Mountain Guide Benjamin Felix Vicencio gets an overview of Qori Kalis. Fig. 7: After several snowy days initially, high pressure built in over Quelccaya, resulting in extensive melting at all elevations on the glacier. Meltwater production led to hours of repeated calving at this ice face, filling part of the lake with ice fragments. Fig. 8: Meltwater runoff from the ice margin (above rocks in this view) brought greater discharge to many streams than we had seen previously. Fig. 9: Evidence from one of the runoff channels of high discharge during the wet season; these are roots from a plant which had become established near the stream. Fig. 10: At the summit AWS, Felix is always eager to help. 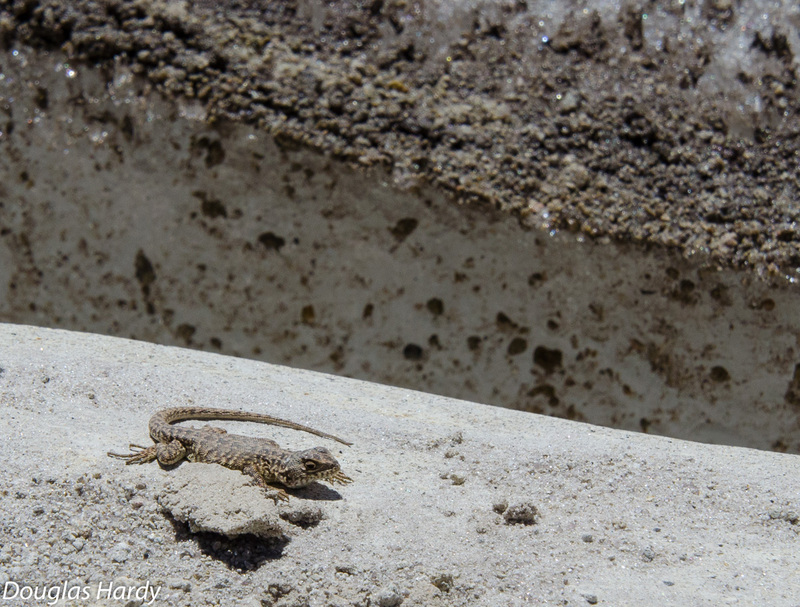 For the past 12 years, the station's enclosures have been buried upon our dry-season arrival. During the current El Niño event, accumulation was much lower than normal. Indeed, at the end of April - with potentially 6-7 months of ablation ahead before the next wet season - accumulation (w.e.) was less than any other year of the 2003 ice core record since at least the late-19th century*! We will soon provide more details of this extreme situation. Fig. 11: The outlet glacier just above our camp, where a major focus of the most-recent expedition was to study the breeding of Diuca speculifera or White-winged Diuca-Finch - the "Glacier Bird of the Andes". Fig. 12: Four intensive days were spent searching for active nests, which diucas build directly on glacier ice in well-protected, hidden locations (earlier, initial details here). Fig. 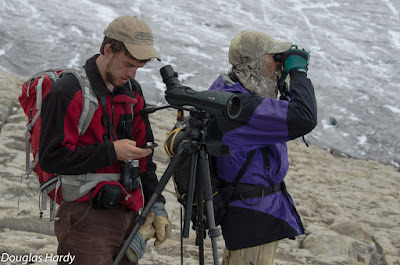 13: Locating active nests of any bird species requires patience and astute observation skills. 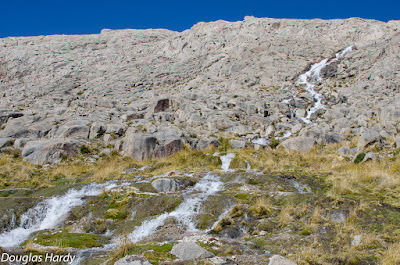 Extra motivation is required to do so in the snow at elevations above 5000 meters. Fig. 14: Two key members of the nest-searching team. 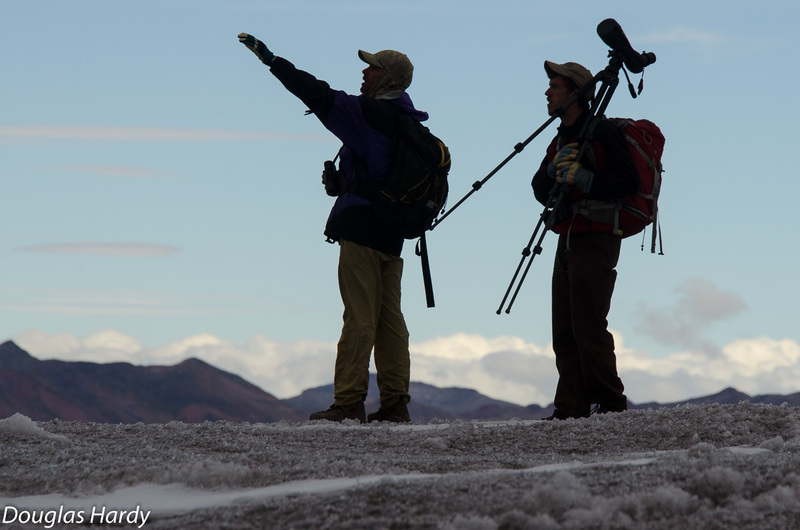 All bird observations throughout the entire expedition are available in eBird (~50 spp. 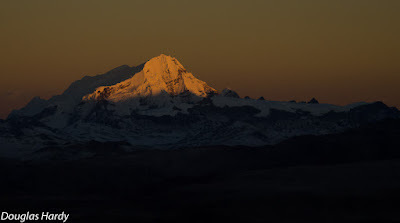 from >4800 m). Fig. 15: An adult Diuca speculifera seeking insects on floating ice fragments (see lake in figs 7 & 11). Fig. 16: At the site of one diuca nest, high on a 60-meter cliff face. Ideally - as in this case - the birds choose nest sites which are safe from predation (esp. Fox, Pseudalopex culpaeus and Mountain Caracara, Phalcoboenus megalopterus) and offer thermal protection (esp. heat loss by longwave radiation). The actual nest site here is ~2 m to the right of the person. Fig. 17: A juvenile diuca begging for food from a parent. Fig. 18: Tremendous biodiversity exists in Cordillera Vilcanota. 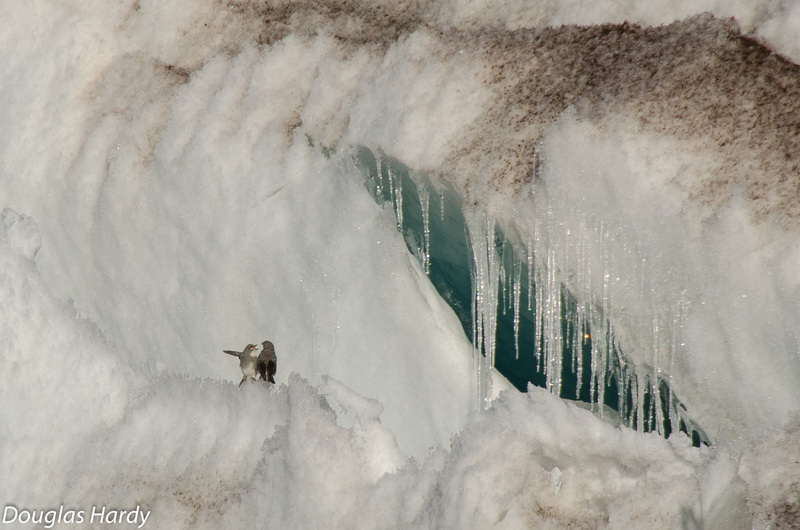 Here a lizard basks in the sun adjacent to glacier ice (background), an atypical environment for most lizard species. Fig. 19: Quelccaya margin just south of the section we concentrated on this time. A decade ago this margin was also a steep cliff, with numerous diuca nests every year. However, over the past 30 years our measurements with Dave Chadwell (Scripps & UCSD) document that the glacier in this area has thinned by more than 60 meters (paper in review). Where will diucas nest in the future, as recession of the ice cap accelerates and suitable locations disappear? Fig. 20: Sunrise on Nevado Ausangate, highest peak of the Cordillera Vilcanota (6384 m). Snow and sampling tools are packed and ready to help assess 2015-16 El Niño event impact to date at Quelccaya. 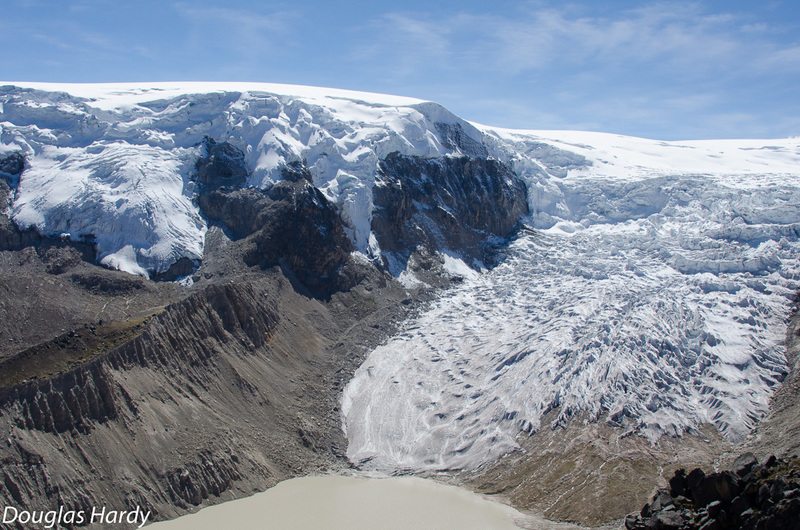 We will be at the glacier until early May, playing in the snow and recovering frozen samples, Also planned are retrieval of AWS measurements, servicing the station, and doing a geodetic mass balance survey. Some exciting ecology research is part of the program; stay tuned for further details! Snow accumulation at Quelccaya Ice Cap seems to have reached a maximum in early February this year. Despite a couple minor snowfall events, snow depth at the summit early in April has already decreased by about one-third, reaching 29% of the median for 4 April (based on 2005-15). For perspective, snow depth is now less than half that of the previous early-April minimum. The water equivalence (w.e.) of 2015-16 accumulation to date is not known, and won't be until a density profile is made. Although it is possible that the snowpack w.e. is not as anomalous as depth, due to melting and even rain, the correlation between depth and w.e. at Quelccaya summit is typically strong. Additional snow accumulation after early April is not likely, as the conclusion of the wet season, or the "snow-accumulation decay date" (Hurley et al., 2015) occurs between by mid-March and mid-May. And even in years when the wet season continues into May, the rate of accumulation generally decreases substantially. The image above illustrates anomalously low snowfall of the 2015-16 El Niño year. This is a nearly cloud-free view from 24 March, depicting the seasonally-green wetlands (bofedales) and the numerous lakes impounded behind moraines - many of which formed within recent decades. A transient snowline near the margin delineates old glacier ice of the ablation zone and this year's accumulation. 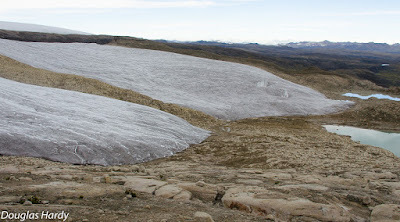 At least one other snowline is faintly visible, particularly on the west side, which may represent ablation-zone ice with a thin cover of 2015-16 snow. Comparing imagery of snowcover extent from year to year on a fixed date is risky. Only by observing the minimum extent of snow cover prior to the next wet season can one assess accumulation in a simple, meaningful way via satellite. During this important El Niño year we will continue to monitor snowcover. In the meantime, fieldwork will be undertaken at Quelccaya during April and May to assess snowcover depth along transects, measure density, and obtain samples for comprehensive chemical and isotopic analysis. 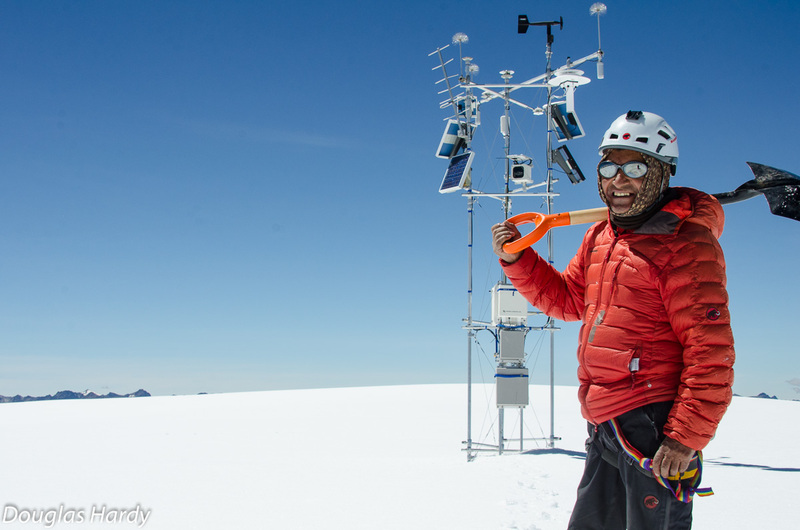 Measurements at the AWS and time-lapse images will be recovered which will help us better understand how this strong El Niño is being recorded at Quelccaya. 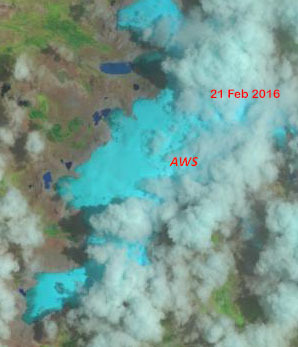 The Landsat image above depicts snowcover at Quelccaya Ice Cap as of Sunday morning (21 Feb. 2016). 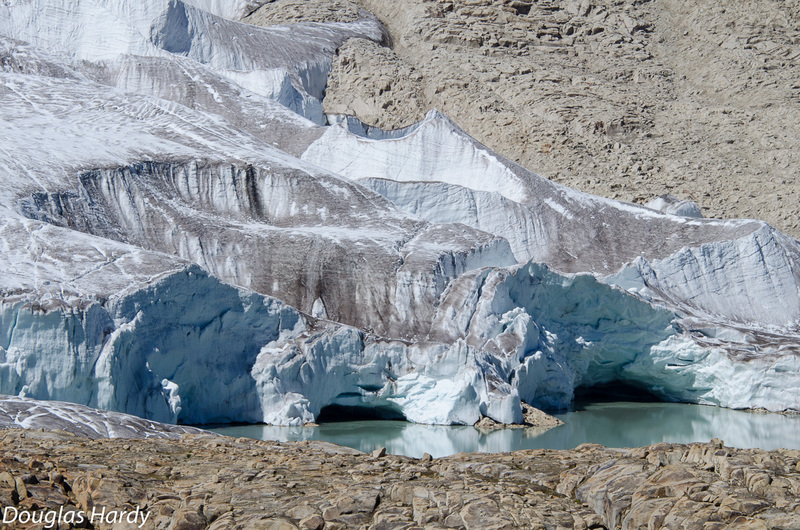 Despite greater than 50% cloud cover in this scene, the glacier's western margin is mostly cloud-free. Puffy cumulus clouds are likely due to morning convection, which appears rather strong in approximately the center of this cropped section. With only minor imagination, one can see that the transient snowline is slightly higher than the glacier margin, perhaps by ~100 m elevation. This is not atypical of May or June, but very unusual for February. Darker areas near the margin are likely bare glacier ice of the ablation zone. After decades of strong thinning (check our open-source manuscript on this, in review and available here), the albedo of this ice is low due to dust concentration, enhancing ablation through a positive feedback loop. 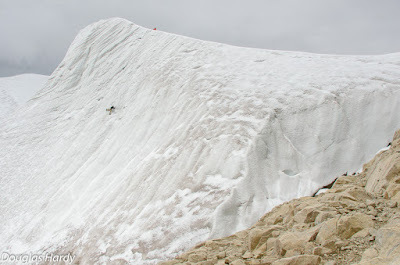 So why do we not see more snow on the glacier this year? With the very strong El Niño underway, snowfall at Quelccaya has been much below normal. 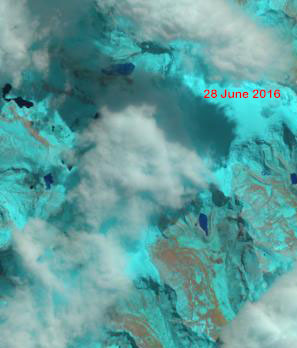 At the time of the image above, accumulation for 2015-16 was only 67 cm at the summit. Compare this to the 21 February median of 1.59 m (2005-15), demonstrating how anomalous this year is at a location with typically consistent accumulation. With only approximately 4-8 weeks remaining before the dry season typically begins, it appears that 2016 could be a year of very negative mass balance at Quelccaya.